Marble has undoubtedly a unique attractiveness, particularly when we take into account its extraordinary hardness and resistance to the passage of time. When we look at a beautiful sculpture, however, those attributes become irrelevant, since the purportedly stiff material easily turns into an utterly malleable one. 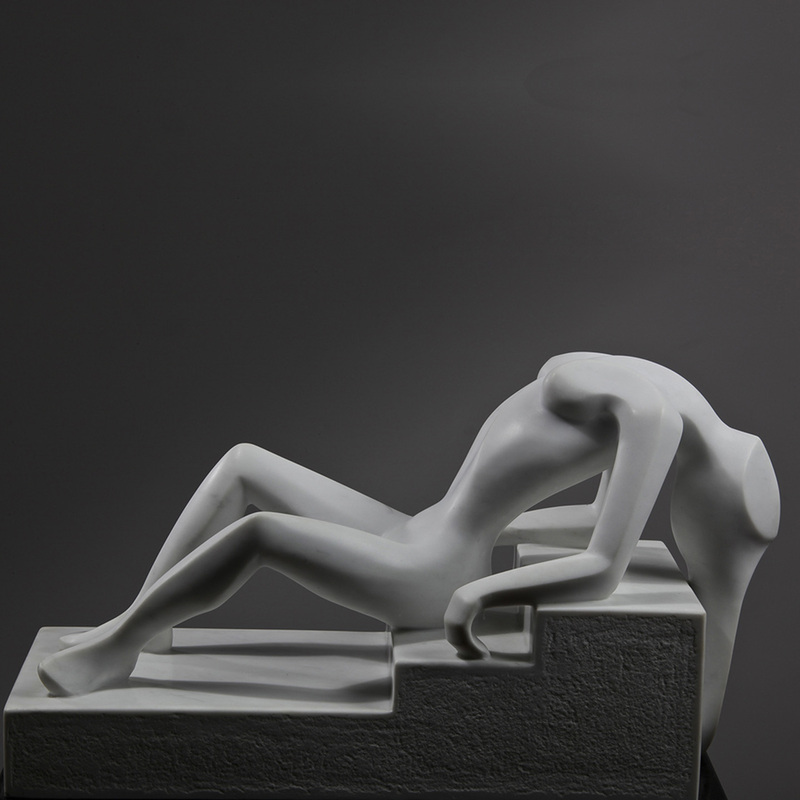 María Andrea Anzorena´s remarkable work shown here attempts to convey a feeling, inasmuch as the female body twists from head to feet, seemingly alluding to a deliberately or involuntarily unfulfilled desire, restrained only by the limited support provided by a step-like base that symbolizes the unsatisfied wish. The flawless balance arising from the geometrical foundation and the exquisite figure is an authentic aesthetic delight. 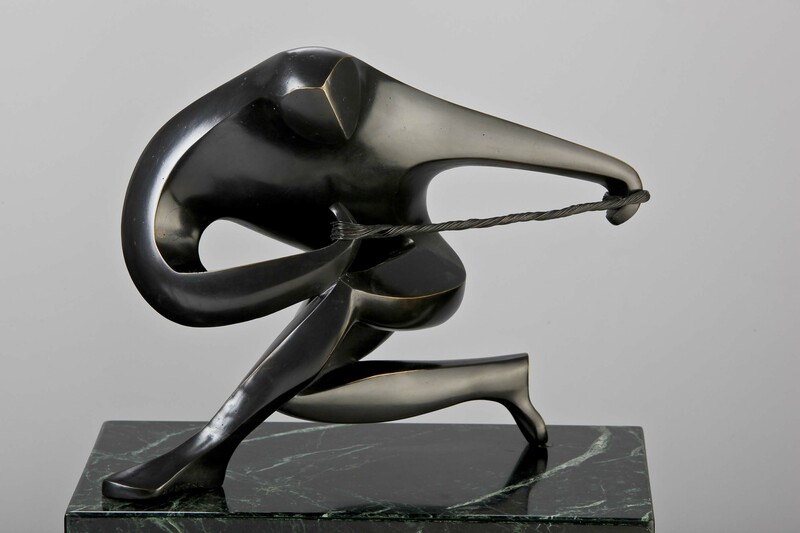 Both understanding and sensibility accompany a superb sculpture that stands as an emblematic allusion to an uncertain world represented by a powerful yet ambiguous figure. 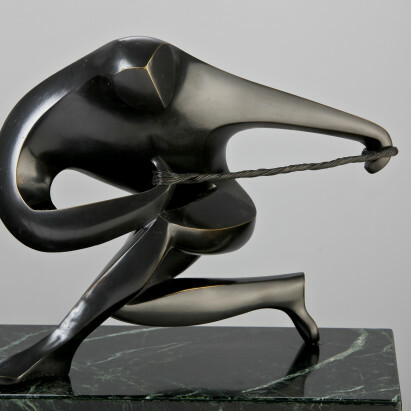 The softly polished surfaces and a rather defiant attitude suggest a fierce inner battle translated by the artist into an imposing, utterly expressive work. Rather than being a cold bronze shape, this outstanding sculpture radiates a unique warmth that stems from the perceived suffering and subjugation, those burdens people often experience and become bearable only if there is hope, a faith also conveyed by this remarkable work. María Andrea Anzorena is a gifted artist and has created a unique masterpiece. 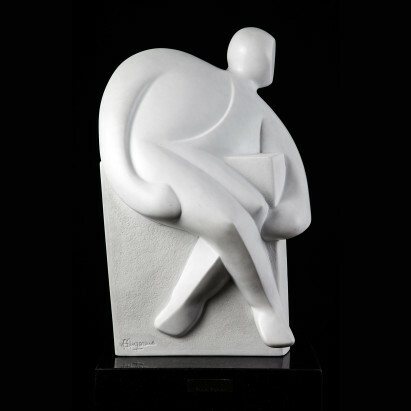 Sculpture´s symbolic ideas asking for our sensibility. María Andrea Anzorena´s feelings announce through her Equilibrium a hopeful beauty, truly captivating in its refined and balanced conception. A subtle presence perceived on her work leads us to the metaphysical understanding of questions by unexpected propositions in casual customs. Her figurative abstract style and barely discernible resonance find in a suggestive strategy the progressive fragmentation of spiritual patterns, inciting to earnest thinking. The artist sublimates reality, extracting from the marble´s heart an image that conveys refinement in its converging lines and stubborn depths, and corroborates her sound knowledge of aesthetic laws. María Andrea Anzorena´s identity stems from the analytic profile of her formal resources, a road traveled with a renewed conceptual vision, unique parameters, and enlightening ideas that gradually build and strengthen her work, thus revealing her authentic creative gift. Concerted musical feelings, odes heralding the message she yearns to unveil through the sensual adventure of development and the resolute faith in the love that her sculptures bear. Impeccable folds, curves, corners and shadows transmuted into a magical tune. Let´s dream about this even symphony.